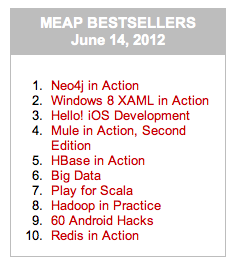 Neo4j in Action Rockets to #1 MEAP Bestseller! Neo4j In Action, by Jonas Partner and Aleksa Vukotic, has rocketed to the #1 bestseller position on the Manning Early Access Program! Graph Database News readers get 38% off. Use code 12neo38.